We’re pleased to announce our newest customer case study documenting Teaching Channel’s use of Video Cloud to provide teachers with a comprehensive library of online video content designed to enrich their professional skills. 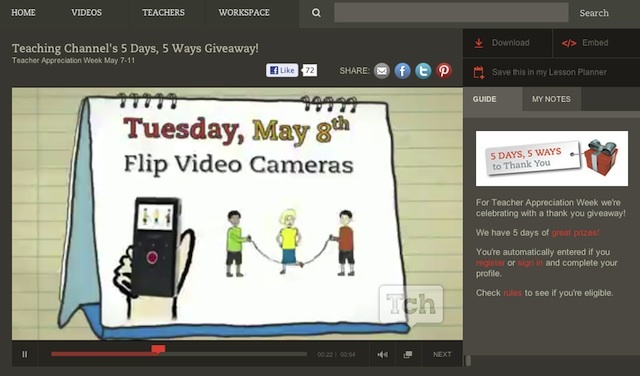 Through its website, teachingchannel.org, the non-profit offers a unique teacher-centric service offering of video content highlighting innovative in-classroom activities and teachers deserving of recognition for innovative methods and results. Teaching Channel selected Video Cloud to meet its need for a robust online video platform that could provide localized access to high-quality and usable video content and materials for all teachers. The organization’s Web developers also required a platform that offered comprehensive reporting and analytics in tandem with the best possible delivery and viewing experience at a suitable price point. Following a successful launch in September 2011, Teaching Channel has expanded its video offering to mobile devices, giving educators the option to not only view content when they want, but they can also watch in their personal devices. It has also exceeded its primary business goal of extending the drop-off rate by each unique viewer, “crashing through the goals” it initially set and thus far surpassing its planned rates for 2012 according Demian Entrekin, CTO at Teaching Channel. To learn more about Teaching Channel’s success with Video Cloud to make high-quality video content available to educators, we invite you to download the case study and also see it for yourself at https://www.teachingchannel.org/videos.